Folk dance is a unit of popular folk tradition.Folk dance is a genre of performing-art of some cultural area or one of the folk-circle within that specific cultural area.Even assuming that folk dance is only a 'performing-art'is restricting its meaning in a limited wat.Folk dance itself is more desscriptive concept than one art-form which has a specific role and significance related to the culture.Any fol-mass,while performing its dace ,is getting emotiiional,mental,physical and spiritual satisfaction on different levels at one time.Folk mass is performing itsfolk dance as an entertainment and assuage on emotional and mental level,as a play on physical level and thesame dance as a form of prayer on the spiritual level.That is why it is important to discernible both social andspiritual aspects of its folk-mass while analyzing any dance. 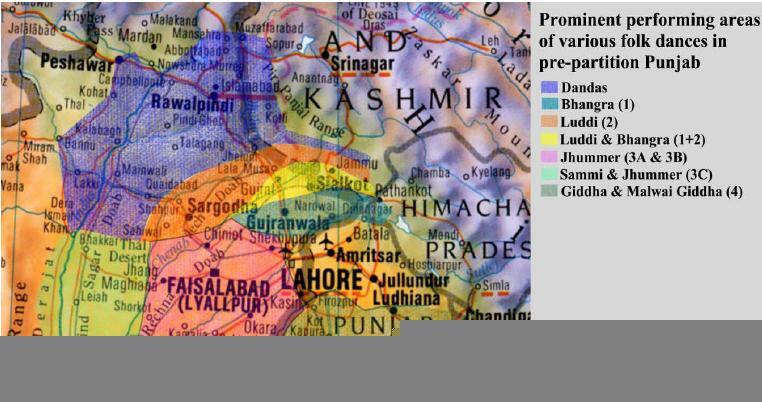 Punjab is a very rich state in terms of the types and number of folk dances that can be found here. 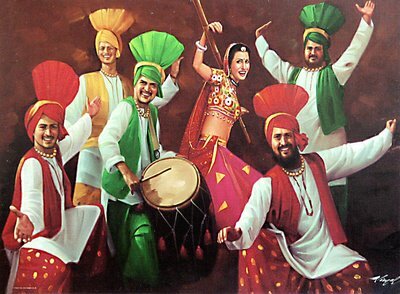 It has many different varieties of folk dances, among which the most famous and popular are Bhangra and Giddha.The growing luxuriantly and vitality of the people of Punjab are vigorously displayed in their folk dances. The moves are full of expression, gestures, vocal remarks, subtleties of motion and uninhibited freedom – it is a dance from the heart! 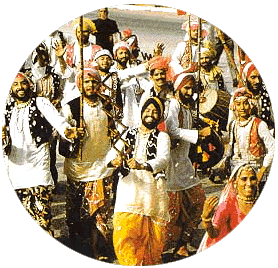 With the drum beat or to the tune of some other instrument of folk music, the energetic feet of the people of Punjab are spontaneously set to give in to inhibition and give instant birth to a folk dance - an expression of the triumphant soul; an outburst of emotions; a sudden release of energy. The dances of Punjab are the clear depiction of the energy and enthusiasm of the lively youth of Punjab. Punjab's folk dances are replete with foreign influences. It is only in Punjab where there is no common dance for men and women.. 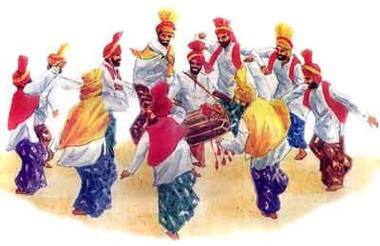 Originally, Punjabis performed Bhangra to celebrate the success of the harvest. Now people perform Bhangra at wedding parties, receptions, birthdays, competitions, and other happy occasions. On the day of Baisakhi, April 13, many farmers, engineers, teachers, shop owners, and other sorts of people perform Bhangra. In the villages, with large drums, called dhols, people circle round and round leaping and laughing. Persons of all types of social classes perform Bhangra together. Even the elder’s occasionally join the young to celebrate and dance Bhangra. 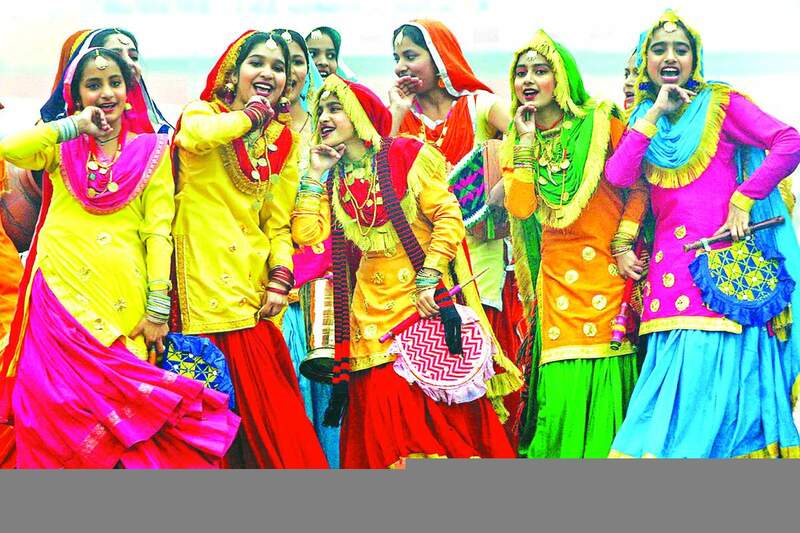 Giddha is Punjab's most famous folk dance for women. In Giddha, the women enact verses called bolis, folk poetry, and dance. The subject matter of these bolis includes everything from arguments with the father-in-law to political affairs. The dance rhythm is set by the dhols and the distinctive hand claps of the dancers. These days, people associate Giddha with Bhangra. 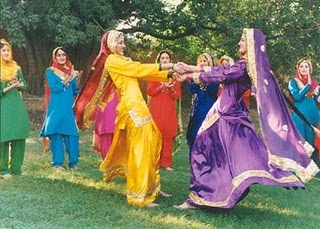 This dance, originally from Sandalbar (now in Pakistan), is very much a part of Punjab's folk heritage. It is a graceful dance based on a Jhumar rhythm. Dancers circle around the drummer and sing graceful lyrics as they dance. Luddi is a victory dance where people do special movements of their heads. The costume is a simple loose shirt. The dancers put one hand on their backs and the other hand in front of their faces. The body movement is sinuous, snake-like. There is also a drummer in the center of the dance. Also called the Gaatka dance, this is a dance of celebration. Two men, each holding colorful staves, in rhythm with the drums dance round each other and tap their sticks together. This dance is often part of marriage celebrations. Muslim holymen, called pirs, perform this dance. Generally they dance in their hermitages (khangahs). People perform the dance while sitting. Sometimes they dance around the preceptor's grave. Normally the dancer wears black. Traditionally women of the Sandalbar region, now in Pakistan, perform Sammi. The dancers dress in bright coloured kurtas and full flowing skirts called lengas. A particular silver hair ornament is associated with this dance. Similar to bhangra, men dance in a circle. Literally Jaago means wake up! 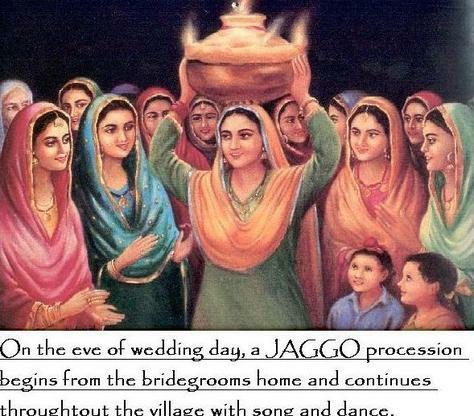 When there is a marriage in the house, girls dance through the village streets carrying a pot (gaggar) decorated with lightened candles and sing Jaagu songs. The themes of the songs are social and usually a bit of teasing, often aimed at elders, goes with the song. Women perform this dance in pairs. They cross their arms, hold each other’s hands and whirl around singing folk songs. Sometimes four girls join hands to perform this dance. 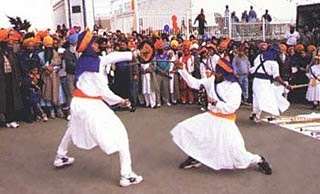 Gatka is a Sikh martial art in which people use swords, sticks, and daggers. People believe that Guru Hargobind Sahib started the art of gatka after the martyrdom of fifth guru Guru Arjan Dev. Wherever there is a large Khalsa Sikh population, there will be Gatka participants, which can consist of small children and adults. These participants usually perform Gatka on special holidays such as Bhaisakhi and Gurpurab.